Posted: May 23rd, 2017 under Hamradio, LoTW. 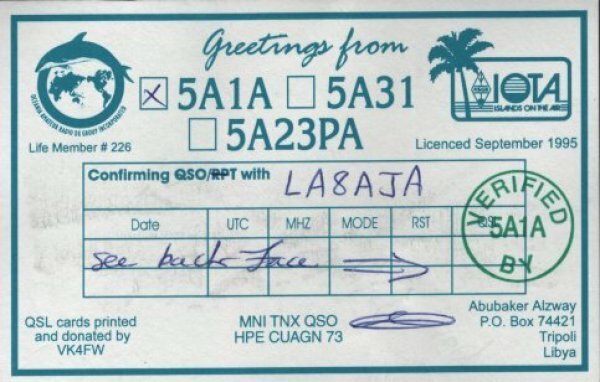 Last year, 5A1AL was approved for DXCC. Since I did not have 5A confirmed on LoTW, I managed to work him on 30M CW. He did also get a manager, W5UE, who had an OQRS system set up. I requested confirmation for the 30M QSO, and e-mailed him to get all my old 5A1A contacts uploaded as well. By doing this, I got #332 on LoTW and 5A confirmed on many bands on LoTW. I did have a paper-QSL for those contacts from before. A while later, 5A1AL chose to do the qsling himself. Hopefully it works as good as it did when I requested from W5UE.